On its latest U.S. tour, Compagnie Käfig stopped in Atlanta for one evening to present its popular program featuring two 30-minute works, Correria (translating to “running”) and Agwa (meaning “water.) The performance touted the “raw and revolutionary blend of French and Brazilian energy” that the company has become known for, seamlessly mixing the bold verve of street dance with the cleaner articulation of contemporary stage dance. This company, which is still young in its own right, has passed a milestone however. Throughout the show, it became obvious that these performers had at some point in their last 250-plus shows in more than 17 countries transformed from being just Brazilian street dancers, plucked up in Rio de Janeiro and mentored by a French choreographer, to fully-converted creatures of the stage, comfortable and confident in their new roles as internationally touring concert hall performers. Compagnie Käfig dancer in ‘Agwa.’ Photo courtesy of the company. While they still had a robust approach to the choreography, it was also evident that they could probably do the choreography in their sleep though, which ultimately took away some of the magic. The exciting, in-the-moment, on-the-edge-of-your-seat sensation one gets when watching street dancers wasn’t fully there, with one dancer especially appearing like he was just going through the motions. Still, this all-male dance troupe delivered a fascinating and unique show that captured the environment of Rio de Janeiro. The first work, Correria, is based on the hurried streets of the city; something that Artistic Director Mourad Merzouki noticed when he first came to work with the dancers in Brazil. Based on the act of running, the work goes from moments of humor to something more emotionally powerful. The piece opens in silence, a tactic used interchangeably throughout with various musical arrangements by AS’N. Two dancers are on their backs, with feet running in slow motion in the air above their bodies. As the lights fully illuminate them, they begin to breakdance, with the other dancers soon joining them. The highlights of this work are two pas de deux. The first, featuring a dancer of smaller stature with another of medium build, presents a series of lifts, dips and balances, with the smaller dancer’s feet in constant motion, as if he can’t slow down. It seems to imply how our over busyness and constant hurried state of being infringes on our lives, upon our very humanity and our ability to connect. The second pas de deux comes later and features some gasp-worthy moves and steps, such as a man diving onto the top of his head from a standing position (using no hands, mind you), only to flip forward and land on his feet again! Compagnie Käfig performs ‘Agwa.’ Photo courtesy of the company. The use of stomping, strategic props, and a white screen for a pantomime-like solo are each creative and ensure that the audience never gets bored. This visually spectacular and exhausting piece perfectly leads to the next work, one illuminating thirst. Agwa, a work that actually came two years before Correria, is a tribute to water. 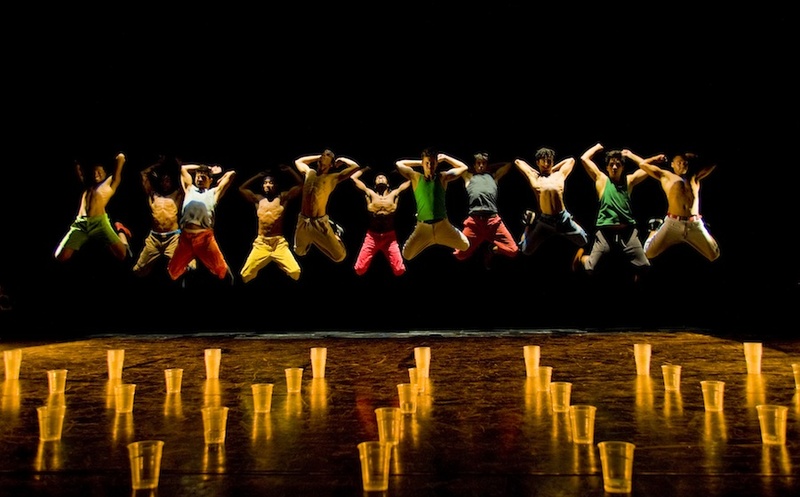 With hundreds of plastic cups covering the stage, dancers suddenly have a maze in which to perform their increasingly virtuosic steps through. While the choreography is mostly stimulating and the idea is one-of-a-kind, Agwa seems a little dry though – no pun intended. The meticulous use of the cups overshadows the dancing at times, and with such strong and passionate dancers, it seems a shame to see them contained. If Compagnie Käfig was to add one element to the program, I think the audience would most enjoy something improvisational, calling upon the street dancers’ roots in the favelas. They could benefit from some unfettered independence – even if Merzouki did name them “käfig” (meaning “cage” in both German and Arabic.) I hope these dancers don’t lose the rambunctiousness of hip-hop, a quality that sets the style apart from all other movement. What’s your 2015 Dance Goal? Tell us and WIN $250 in dancewear!